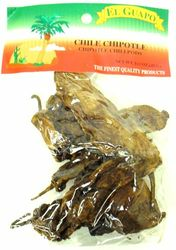 El Guapo Dried Chile Chipotle Chili can be used whole to give flavor to stews, soups or in the braising liquid for meats! Chipotle chiles have a smoky flavor and definitive heat that makes them unique. If they are pureed or soaked they would go perfectly with sauces!! El chile chipotle seco El Guapo, pueden ser usados enteros para darle sabor a sopas, guisados, o para caldo para cocinar la carne. Los chipotles tienen un sabor picosito y ahumado que los hace unicos. Si son hechos puree o estan ba�ados son perfectos para hacer salsas!! When I lived in the Northern U.S. this product was easily found in a store. This product was as good as I have used in the past. Service was quick, I will continue to buy this product. I make my own chili powder and chili sauces, so it was a delightful surprise the first time I used this. It adds another layer of flavor with a subtle smokiness without adding more heat. Now prefer it over using canned chipolte peppers. Highly recommended! Have also had excellent service with MexGrocer! Thank you!